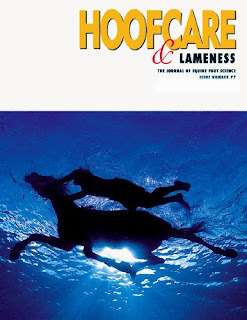 Fran Jurga`s Hoof Blog: News from Hoofcare + Lameness: Warning: Lawn Clippings Are Not Good for Horses! Vet and farrier readers: This post is your clients--please share! There’s no mistaking that sound: the mowers have started. Is there a more sure sign of summer? If the sound of mowers is the first sound of summer, the second should be the sound of horse owners explaining to landscapers, lawn crews and neighbors that, while the thought is kind, it is NOT okay to dump mulch mower bags or raked-up grass clippings into horse paddocks or feeders. Wet green lawn clippings are often left in mower bags or in piles, where they start to ferment quickly. A hungry horse will nibble at the clippings, and the fermentation (and the gastric gases it creates) in the gut can be deadly. We won’t even talk about the chemicals from herbicides and fertilizers! Laminitis might be a real risk too, particularly for horses with other considerations like insulin resistance, and for ponies. If possible, make sure that town and county road maintenance crews that mow roadsides and median strips know not to dump trimmings into horse pastures. When you arrive home in the evening, check your pastures, paddocks and arenas, especially along any sections facing neighbors or the road to make sure nothing has been dumped. Consider writing a letter to the editor of your local paper, and post this article in your feed store and any stores that sell lawn mowers or at nurseries and farmstands that sell plants. Chances are, your neighbors and community members are completely unaware of the dangers of grass clippings to horses, ponies, donkeys and mules. Remember, they probably mean well. Do you have experiences with horses suffering the ill effects of grass clippings? Or neighborhood relations suffering? I know this is sort of a suburban issue, but that is where so many of our horses live these days...or the suburbs have come to them! I was at a party once when a gentleman came up to me and smugly introduced himself as a neighbor to the boarding farm where my horse was living. He informed me that he was kind to animals and dumped the clippings of his vast chemical green carpet into my mare's paddock. I was speechless, and had to be, as the farm's relationship in the neighborhood was at stake. You might need that neighbor at a zoning or board of health meeting sometime. Excellent reminder. I am going to link to you today, since on HorseFeathers we have been spending a lot of time discussing hoof issues, this will answer a lot of questions for people! Gotta tell you Fran, your blog rocks. ;) Have a great day there. SaferGrass.com is a great source for information on feeding grass as well as many articles on laminitis - a very useful resource. dumb question maybe, but what happens when you mow your pasture? Your pasture probably isn't treated with Chemlawn and if you are smart, you cut it when it's not too long, allow it to dry out first, then turn them out on it. It's wet, still fermenting grass that is the danger....and of course, the chemicals. Signs posted on your fence will help, hand delivering a note of education about it to your nearby neighbors (and to the local lawn treatment cos) would help.